Congrats for completing your BA. Now, are you are interested in doing short term courses after BA? Or what next? Let us analyze the scenario. Maybe you have a BA in English, History, Public Administration, Economics or Christian Studies. Or a BA in Sociology, Political Science, Tamil etc. Very Good. What next? You might have finished these courses either in Regular or Correspondence. That doesn’t matter. After this, you think only about two options. One, go for higher studies like an MA degree etc. to become post graduates. Or go for a job. But wait. You have some other wonderful options before that. You can do some short term certificate courses. Only for 1 month or 3 months. Why? There is a popular saying in Tamil, “kaithozhil ondrai katrukol kavalai unakkillai othukkol”. No one is stopping you from going for a job or doing PG courses after graduation. You can go for it. But having a certificate in professional courses will give you higher job prospects. 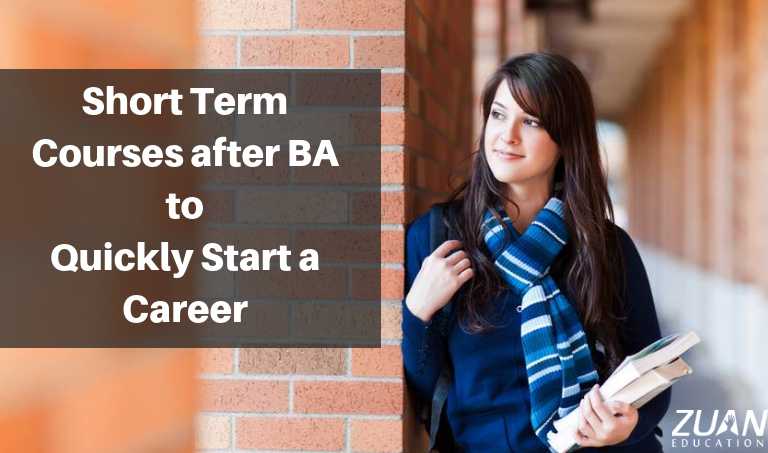 Moreover, after doing these short term courses after BA you will have a lot of career options. You have to understand that the below courses after your graduation degree will open a lot of job opportunities. Significantly, there is no specific eligibility criteria or entrance exam to these short term courses after BA. You can do these short-term courses in your free time. Now don’t fear for the word “Marketing”. This word takes your thoughts to the person wearing a tie and marketing goods from house after house. No, no it is not that. You will sit in front of a computer and do marketing. Furthermore, Digital Marketing is a very much demanded job oriented course. You will get a real-time industry-based classroom and training sessions. Markedly, you need not do any calculations. Significantly, no numbers or Maths is involved. Well, there are many renowned private institutions that will practically teach you Digital Marketing. This course is only for 80 Hours. You must really like the colors and graphic design of many websites. They really attract you. You can easily learn this course because they will give you a lot of practical training. You can design your own website during the course. Moreover, this course is only for 120 Hours. You can do this course if you have a BA in English, History, Sociology etc. Every company will have a lot of websites, blogs, and other social accounts. And they will need Content Writers to write on all these platforms. To start with, you will get a salary of Rs 243,264 per year. Content Writers have a good and bright future. There is no doubt you will have a WhatsApp, Facebook or Twitter account. Do you know that you can earn money from WhatsApp and Facebook. Yes. this is called Social Media Marketing. Find out how to attract an audience, give value for followers, develop a brand. Furthermore, arrange targeted exhibit campaigns on platforms like Facebook and Twitter. Significantly, utilize Shared media even for customer services & PR. Moreover, know the large-scale range and risk of social media. Eventually, build a social media strategy to create a vision and reach goals. Your salaries range from Rs. 2 lakhs per annum and raise growing to Rs. 8 – 12 lakhs as you get promotion. This is one of the useful short term courses after BA. Search Engine Optimization (SEO) is the method of promoting the quality of visits to a website in search engine. Furthermore, local search engine optimization tactics. Significantly, basic HTML tags which needed in on-page and off-page technique. Equally, Advanced Google tools such as Analytics, Adwords and Webmaster, Social Media Optimization (SMO) and the latest Google updates. PPC is one of the greatest ways of Direct Online Marketing. Moreover, PPC results are quicker when compared to SEO operations. Significantly it is best if you are planning a startup business. Furthermore, many big companies hire PPC experts with a high paying job in MNCs & corporate. So friends you can choose from any one of the short term courses after BA. Instead of doing a PG Diploma later or other courses like hotel management, MS Office etc you can choose from the above-mentioned job-oriented courses. It will be good if you do these courses from private professional institutions. You can meet them personally and have a group discussion to check which course will best suit you after BA. You can even finish these short term courses after BA even as crash courses. This means you can finish these courses even in one month. After finishing this course you can either pursue your MA or any other PG course or get a professional job with this short term course. Best of Wishes. Have an Enriching Career.